I designed the button using my most recent finish, Diamond in the Rough. I figured AMH fabrics would give the button the "zing" it needs. ;) We chose the name based on the Sisterhood of the Traveling Pants books... flashback to middle school! I hardly ever work with black but I now love how it looks with jewel tones. You'll be seeing more of this quilt as I plan out my "starter block/section" during February. My quilt will always go to Ashley, and I happen to be meeting up with her in Feb. for the NJMQG meeting - therefore, it needs to get done before that! Then, Ashley will add onto mine, while I'm adding on to someone else's - and we keep passing them on. It's going to be way too fun. 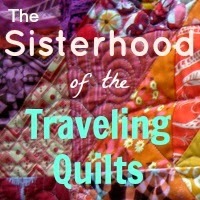 Follow us along on our Flickr page and on Instagram (#sisterhoodofthetravelingquilts) to see our progress! Oh man this is going to be so fun! Someday I'll actually join a bee and be apart of the fun. So excited for this!! Thanks for making the adorable button! I'm so nervous tho!! I have zero ideas!! It will come..deep breath. Right? ;) Haha. Can't wait to see yours!! It does, indeed, sound like fun. Enjoy! That sounds fun! Our guild does a border around type of thing like that - you make a center and every month the quilt switches to someone else to add a border. And I know another quilter who passed quilts back and forth with her mom for a year doing the same - adding to what was put on before. 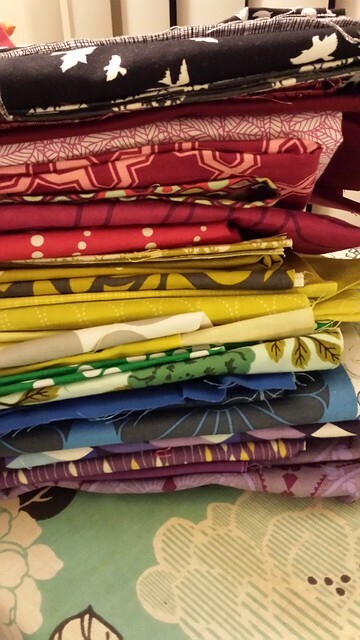 It will be neat to see each of your "fingerprints" in the work you add to each other's quilts!